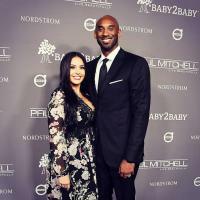 (EMAILWIRE.COM, April 13, 2019 ) Baby2Baby, an organization that provides low-income children with clothing, diapers, and basic necessities held its annual gala at 3Labs in Culver City last November. The event saw a parade of celebrity participants including board member Jessica Alba as well as Katy Perry, Jenna Dewan, and Kelly Rowland who helped drive home Baby2Babys mission of protecting the most vulnerable among uschildren. Over the course of the evening, donors raised more than $4 million that will go to families in need across the US. seen it first hand, I see the way it affects the children when they get that one thing they needed, said Giving Tree Award recipient Amy Adams. I saw a group of children excited because they got socks. Its really amazing the way theyve identified this need and then gone head first into this organization, expanding it to different states and to disaster relief. Theyre inspiring. In the last seven years, Baby2Baby has distributed over 50 million items to children in homeless shelters, domestic violence programs, foster care, hospitals, and underserved schools, as well as children across the country who have lost everything in the wake of disasters. Step and Repeat LA produced an impressive 8 x 30 media wall for this star-studded fundraiser. Because there was so much media in attendance, this was the location for hundreds of photo ops. Step and Repeat LA is the leading backdrop company in the Los Angeles area, but their products are sought after around the country. They specialize in red-carpet backdrops, better known in the film and entertainment industry as ‘step and repeats’ and they provide media walls for a more dramatic effect. Step and repeats are used at festivals, grand openings, birthday parties, weddings, business events, and fundraisers like Baby2Baby. 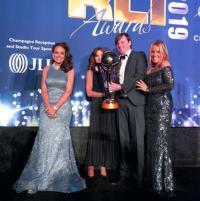 (EMAILWIRE.COM, April 15, 2019 ) After fourteen years, Retail Leisure International (RLI), in association with Chalhoub Group, hosted the prestigious Global RLI Awards in the US for the first time. Previously held in London and Dubai, this year the illustrious and renowned event was held in Los Angeles at Universal Studios Hollywood on April 3rd. with and who refuse to settle for anything but the very best. Once again, it was a spectacular evening, recognizing and celebrating the most visionary and innovative retail and leisure concepts from around the globe. Step and Repeat LA created an impressive 8 x 14 media wall for these prestigious awards. It was the perfect backdrop against the blue LA sky. Step and Repeat LA is passionate about their work, always perfecting their operations to make sure their customers get the very best experience every time. 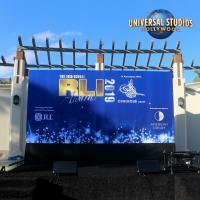 In the event production field, they understand how important time constraints are and are available to make sure all projects are perfect just as they were for the Global RLI Awards. 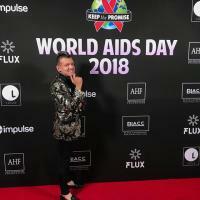 (EMAILWIRE.COM, April 16, 2019 ) AIDS Healthcare Foundation (AHF), the largest global AIDS organization, recently held a variety of community events and formal observations in many of the 42 countries around the globe that AHF serves. much work to be done in the global fight to defeat the epidemic. In the U.S., AHF was host to four high profile events in New York City, Chicago, Miami, and Los Angeles along with numerous smaller gatherings and commemorations. The LA event was held at Hollywood nightclub, Boulevard 3, on Sunset Boulevard. It featured an all women lineup of entertainers hosted by Rocsi Diaz with musical performances by the artists Monica, Chesca and DJ-ing by Carisma. AHF was on hand at many of the events to provide free HIV testing services, distribute free condoms and hold interactive sessions to raise awareness of HIV/AIDS and related issues at multiple locations throughout Africa, Asia, Latin America, the Caribbean, Europe and the U.S. While millions of people today are accessing lifesaving antiretroviral therapy, millions more still desperately need it. The end of the epidemic is only possible if governments and world leaders Keep the Promise on AIDS. Step and Repeat LA provided an 8 x 10 seamless media wall for this important annual event. Media wall rentals are also available. 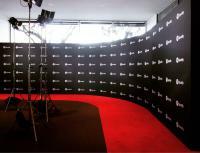 Step and Repeat LA is a company that is ready to provide whatever is needed for red-carpet events. No job is too small or too big for this leading LA area backdrop company. Also, well known throughout the country, this experienced company is readily available to discuss a customers needs for personal events such as birthdays and weddings as well as large corporate events, charity fundraisers, and special events like World AIDS Day. 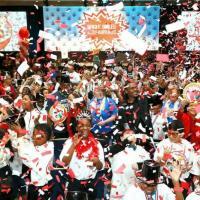 (EMAILWIRE.COM, March 31, 2019 ) Colgate Bright Smiles, Bright Futures (BSBF) reaches children around the world with free dental screenings and oral health education. Colgates commitment to building a lifetime of healthy habits provides children with burgeoning self-esteem and a foundation for success – that’s the Power of a Bright Smile. Lots of bright smiles in front of Step and Repeat LAs backdrops! Today, the Colgate Bright Smiles, Bright Futures educational curriculum is available in 30 languages. In many countries it has become a part of the permanent school curriculum. In partnership with Terra Cycle, Kids in Need Foundation and Sams Club, Colgates BSBF program, brings supplies to under-served communities in Arkansas. Step and Repeat LA printed fun and educational backdrops for Arlington Elementary Schools first Colgate BSBF awards. 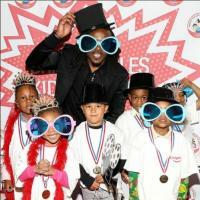 Brandon Carr, football player for the Baltimore Ravens, spent the morning with hundreds of kids who hit the Colgate red carpet at the Colgate Bright Smiles Kids Awards. Step and Repeat LA is the company to turn to if you need quality work and fast turnarounds. Meeting rush-order deadlines and shipping in 24 hours are just two of their capabilities. This company has an impressive variety of high-quality products including custom backdrops, carpets in 13 colors, stanchions, media walls, and photo booth rentals. In the Los Angeles area, they will also deliver, set up and take down media walls, backdrops, and red-carpet displays, but they also ship their products throughout the country just like they did for the kids at Arlington Elementary School in Arkansas. A Birthday Bash for Saweetie! 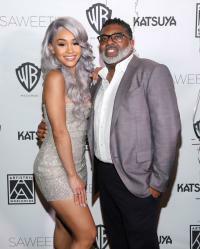 (EMAILWIRE.COM, April 01, 2019 ) American rapper and songwriter, Saweetie turned to Step and Repeat LA to help put the finishing touches on her birthday party at one of the Katsuyas restaurants in the Los Angeles area. Currently, this unique eatery has seven locations in LA, as well as South Beach, Kuwait, and Dubai. Saweetie Diamont Harper (born July 2, 1993), is known professionally as Saweetie. It seems music must run in her family as her mother, Trinidad Valentin, was a video vixen with starring roles in L.L. Cool J and R. Kelly clips. Step and Repeat LAs backdrop is a perfect match for Saweeties outfit! Saweetie turned to a career as a rapper, she studied communications first at San Diego State and then finished her business and communications degree at USC. She interviewed with hospital billing departments, but every job offer felt wrong. When Saweetie recorded Icy Girl, she was juggling a bunch of odd jobs and filming 15-second raps in her car to post on Instagram. I finally decided to give music my all. If it didnt work out and I had to move home, fine. I had to give it 100% first, she said. And it has. After the release of her debut single, “Icy Girl”, she was signed to Warner Bros. Records in partnership with Artistry Worldwide. Step and Repeat LA provided a custom print on non-glare, matte, polyester fabric for this glitzy 8 x 8 backdrop. It was a perfect match for Saweetie in her glitzy outfit. Step and Repeat LA is a one-stop shop for your red-carpet events. Not only are they the leading backdrop company in the Los Angeles area, but are well known throughout the country. This knowledgeable company can provide everything from small lollipop displays to impressive hedge walls. And they are readily available to discuss your needs for personal events such as anniversaries, weddings, and birthdays even for celebrities like Saweetie! (EMAILWIRE.COM, March 23, 2019 ) The 6th Annual Gold Meets Golden Party was held prior to the Golden Globe Awards in January. It was hosted by Academy Award and Golden Globe-winning actor Nicole Kidman and Olympic Gold Medal recipient Nadia Comaneci. Awards Season with a brunch celebrating the intersection of Hollywood and Sport. The guest list included actors Jessica Chastain, Chrissy Metz and Patricia Clarkson. Nearly 20 Team USA athletes were also in attendance at The House on Sunset in West Hollywood, CA. This Sunset Blvd. 1936 deco-modern gem has been home to Hollywood Legends for 80+ years and is now available the for the first time for exclusive private parties. Past hosts and attendees at “Gold Meets Golden” have included Keith Urban, Kerry Washington, Sofia Vergara, Matthew McConaughey, Cuba Gooding Jr., Jon Bon Jovi and and Seth Meyer. Past athletes include Caitlyn Jenner, Jamaal Wilkes, Rafer Johnson, Greg Louganis, Mark Spitz, Simone Biles, Gabby Douglas, Alex Morgan, and Jackie Joyner-Kersee. For the second year, Step and Repeat LA was honored to fabricate and install a beautiful 10 x 40 media wall with gold medals for this amazing event. Whether its a premiere, a charity or celebrity event, or a showroom display, Step and Repeat LA strives for excellent customer service, high-quality backdrops and products, and efficient installation services. They are passionate about their work and are always perfecting their operations to create the best experience for their customers. They understand how rushed things can be so they offer 24-hour turnaround as well. These are just some of the reasons that Step and Repeat LA has so many return customers like the Annual Gold Meets Golden events. 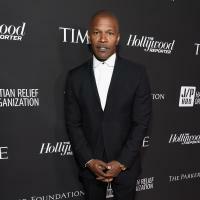 (EMAILWIRE.COM, March 24, 2019 ) Sean Penns annual CORE event, formerly known as the J/P Haitian Relief Organization, raised $3.5 million at their recent event. The evening began with a film on Penns impetus for founding the organization and the evolution of J/P HRO to CORE. Penn introduced the organizations expanded mission, saving lives and strengthening communities affected by, or vulnerable to, crisis and revealed the new logo. from Macy Gray and Billie Eilish, with Yusuf Islam (formerly known as Cat Stevens) headlining. Special honorees included CNNs Anderson Cooper, San Juan Puerto Rico Mayor Carmen Yulin Cruz and Ambassador Kenneth Merten, Haitis special coordinator. Julia Roberts made the presentation to Cooper who was recognized for his steadfast commitment to Haiti. An auction also figured into the program with packages that included VIP tickets to the 2022 World Cup in Qatar; a journey to Haiti with Cooper and Penn; and tickets for Lin Manuel Mirandas Hamilton finale in Puerto Rico. Thanks to the auction and additional contributions by more than 400 guests, the $3.5 million raised will go toward saving lives by strengthening vulnerable communities in Haiti, the Caribbean and here in the U.S. Step and Repeat LA printed and installed an impressive 8 x 32 media wall for this well-attended and highly successful event. There are lots of step and repeat companies out there, and then there is Step and Repeat LA. Long regarded as the top company of its kind in the Los Angeles area, they excel in everything they do. From small family birthdays and anniversaries to big weddings, business events, and festivals – Step and Repeat LA always delivers, is always on time and makes every occasion unique with an added WOW factor like this impressive media wall for the CORE Gala. Step and Repeat LA Celebrates St. Patricks Day! (EMAILWIRE.COM, March 11, 2019 ) Step and Repeat LA is is celebrating St. Patricks Day by offering a 17% discount off entire orders! Now, through midnight, March 17, event planners can take advantage of this 17% discount on entire orders for anything – not just a St. Patty’s party. The Discount Code is: LUCKYCARD17. The skys the limit when party planners combine their ideas with the creative team at Step and Repeat LA. Using the discount for a St. Patrick’s Day event, the end result is sure to dazzle guests maybe a few leprechauns too. (EMAILWIRE.COM, March 11, 2019 ) Spotify hosted its Best New Artist 2019 party on February 7 at the Hammer Museum in Los Angeles. The museum was filled to capacity with a mix of music stars including Rita Ora, Hailee Steinfeld, Nicole Scherzinger, Ashlee Simpson, Evan Ross, and Soulja Boy. Other well known personalities included Quincy Jones, Scooter Braun, Heidi Klum and Terry Crews. The event featured performances from Best New Artist nominees including the eventual winner, Duo Lipa, along with Jorja Smith, Margo Price, Bebe Rexha, and H.E.R. x Halle looked like seasoned professionals when they performed at the star-studded event. This young duo first garnered attention after they began to post covers of pop songs to YouTube. It was their rendition of Beyonc’s Pretty Hurts that caught the attention of the singer herself, as well as her label Parkwood Entertainment in 2015. When Bishop Briggs, English musician, and singer-songwriter, was asked to define what a new artist means, Briggs shared, I think it means releasing as much music as you can because you have the capability to do so, more than any other time [before]. This same moment also provides a space for artists to promote, elevate and bring awareness to the issues they care about: Its also a time to use your platform to talk about causes you believe in whether you have ten people that follow you or twenty thousand. Step and Repeat LA is the leading backdrop company in the Los Angeles area, but their products are sought after around the country. They specialize in red-carpet backdrops, better known in the film and entertainment industry as ‘step and repeats’. Step and repeats are used at charity fundraisers, grand openings, birthday parties, restaurant events, and festivals. They also provide media walls and press walls for more dramatic effects such as Spotifys Best New Artist 2019 party last month. (WASC) and the Western Catholic Educational Association (WCEA). Student enrollment in the fall of 2018 was 845, including 75 international students. Their impressive campus occupies 25 acres with ample room to accommodate academics as well as 16 athletic departments. 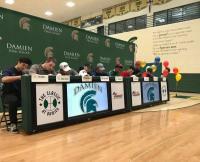 In addition to the standard sports of baseball, basketball, and football, they offer ice hockey, Lacrosse, mountain biking, roller hockey, track and field, water polo and more. Last school year 76% of the student population participated in sports. Step and Repeat LA printed a huge 8 x 20 step and repeat backdrop to be used at many of Damien High Schools events. They strive for excellent customer service, high-quality backdrops and products, and efficient installation services. Passionate about their work, Step and Repeat LA is always perfecting their operations to create the best experience for their customers including high schools!